Door facing each other... Good or Bad? Is there a cure for this? Hi. I need help. We just bought a new house. The door to the guest bedroom and my sons bedroom are facing each other with the guest bathroom door on the middle. I was told that having two doors facing each other is not a good one. Is there any remedy aside from a renovation? 1.1. It has more to do with pyscholgy: where just imagine both parties exit each of the bedroom and eyes "meet head to head". This symbolises perhaps: personal clashes. 1.2. However, if only one bedroom is occupied and the other bedroom being a guest room is vacant most of the time. If so, there is relatively no issue with the two doors facing each other! 1.3. Feng Shui is also about symbolism. Thus the most common symbolic approach is to place a "RED" dot on the same area of each of the two doors. Here, the two RED dots symbolise eyes i.e. see eye to eye with each other. 1.4. How or what kind of red dot? It can a dot much like the pupil of an eye or smaller diameter. And just anything red can be used e.g. a permanent red felt pen or a red circular sticker or even for ladies with eithe chilli red or maroon nail vanish can also be used. 2. Contrary to popular belief; Feng Shui is not all things "renovation or demolishing a wall etc..." Far from it. I cant thank you enough for enlightening me with this issue. I had hesitations buying the house just because of this. I will definitely put a red eye on the door. Again, thank you so much. You helped me a lot. Please see attachment with illustration on where to place the two red dots. In this attachment; I have shown two locations each for the placement of the red dots. 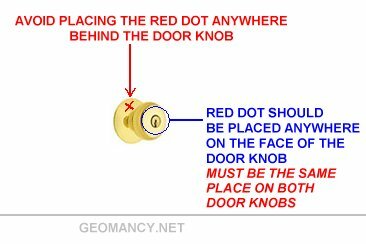 Must avoid placing the RED dot behind the handle of the door knob. As there is no direct path or "view" from the back plate of the door knob. What happens if the red dot fades? Less wear and tear area is actually the key hole area. Or use a durable round sticker.